Alexander Ovechkin might be the most popular hockey player in the world, and part of that is because of a reason cited in ESPN’s World Fame 100: Russia. Russian hockey players have a massive population supporting them across the globe and sometimes it goes beyond just the standard population. Ovechkin was asked about how big a deal it was that he advanced to the Stanley Cup Final. In response, he made a joke that doesn’t actually seem too implausible. 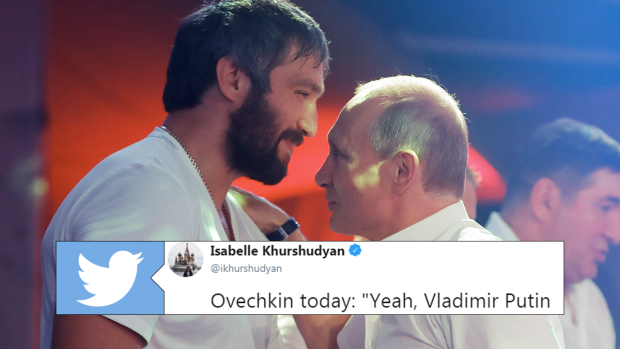 We’ve seen Ovechkin and Putin hang out often and this season Ovechkin made a post declaring that he was part of “Putin’s Team”. On top of all that, Putin even sent a wedding gift when Ovechkin got married. We would imagine that Putin really is excited about the possibility of Ovi winning a cup – probably the only thing bumming him out is he won’t be able to be out there with him.